Despite the relative popularity burnout has these days, it is still difficult to diagnose burnout properly due to a lack of official diagnostic criteria ,. 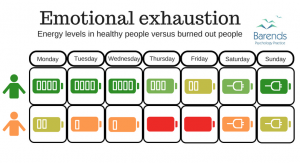 At the moment, a burnout diagnosis is made according to the score on 2 or 3 of the burnout subscales: emotional exhaustion, depersonalisation, and personal accomplishment . The latter subscale, personal accomplishment, is considered by some researchers to be a consequence of the first two subscales and is, therefore, not included in some of the burnout questionnaires used for diagnostic purposes. A problem with a burnout diagnosis is the fact that its symptoms are also common for people with a major depressive disorder. Interestingly, the majority of people with burnout also develop depression, but depressed people do not always develop burnout . This overlap makes it more difficult for therapists and researchers to define burnout and identify its symptoms. Yet, therapists and researchers agree that burnout is more than just depression and that recovery takes quite some time. Based on the burnout causes and the symptoms people with burnout suffer from, this page attempts to narrow down how a professional could make a burnout diagnosis by looking at the three burnout subscales. Everybody experiences times where they are very tired and can’t find the energy to perform well at work. For most people this is temporary and a good weekend or a holiday enables them to recharge enough to be able to function well at work again. For some, however, recharging their batteries takes a lot longer. They may be emotionally exhausted. Emotional exhaustion is characterized by physical fatigue, loss of energy, depletion, and debilitation ,. Also, it is manifested by a sense of feeling emotionally and psychologically drained . Individuals with high scores on the emotional exhaustion subscale cannot recharge themselves due to their busy life. Taking a few days off may recharge them a little bit, but not enough to get back to work again, as can be seen in the image. Feeling tired before arriving at work. Needing more time in order to relax after work, compared to before being burned out. Having little energy for leisure activities. Feeling sickened by work-related tasks. Feeling worn out after work. Being unable to manage the amount of work. Feeling a lack of energy when working. Feeling a lack of energy when it comes to routine tasks at home. Needing more time to do home chores. Procrastinating bigger tasks such a repairing/replacing broken equipment at home. Forgetting or mixing up appointments. Experiencing headaches, gastrointestinal issues, skin problems. Sleeping problems, such as problems falling asleep or staying asleep, and problems waking up. (Advertisement. For more burn-out diagnosis information, continue reading). For a burnout diagnosis to be made, it is important that an individual identifies with most of these symptoms, and that these symptoms are present for at least three months. Identifying with these symptoms alone is not enough for a proper burnout diagnosis. Identifying with the depersonalisation and personal accomplishment is of equal importance. Being emotionally exhausted often leads to feelings of depersonalisation. Depersonalisation is characterized by irritability, loss of idealism, and withdrawal ,. Also, depersonalisation refers to a set of negative, inappropriate, and insensitive behaviours towards clients and work in general displayed by a worker ,,. Individuals who score high on the depersonalisation subscale are often more negative towards their work (devaluation and disgusted of tasks), perform their jobs as if they were machines, and see the clients they work as objects. Finding it difficult to find interesting or new aspects in their work. Talking about their work in a negative way. Being easily irritated by small problems or colleagues/coworkers. Thinking less at work and doing their job almost automatically. Finding work not a challenge at all. Feeling more and more disengaged in work. Finding it difficult to feel empathy for my clients. Having the feeling that they give more to clients than they get in return. Depersonalisation often negatively affects life outside work as well. Individuals who score high on the depersonalisation subscale may be less affectionate towards their partner, engage less with their children, and show less emotion/empathy. The last burnout subscale is personal accomplishment. This subscale refers to a reduced personal accomplishment, reduced productivity or capability, low morale, and an inability to cope ,. Also, it refers to negative evaluations about the self, a sense of minimized personal accomplishment would be shown when a person feels ineffective and incompetent . Feelings that they cannot do any other job than the one they are doing now. Feeling unappreciated or used at work. Feeling less competent in their work than before. Feeling they cannot cope with their workload. Feeling they need more time and effort to achieve less compared to before. Little is known about the time an individual should suffer from the burnout symptoms to be able to get the burnout diagnosis. If these symptoms are present for three months and there is no change expected in regards to workload, job control, and social support, then a burnout diagnosis can be made… if the symptoms cannot be explained through drug abuse or prescription drugs. Kaschka, W. P., Korczak, D., & Broich, K. (2011). Burnout: a fashionable diagnosis. Deutsches Ärzteblatt International, 108, 781. Demerouti, E., Bakker, A. B., Nachreiner, F., & Schaufeli, W. B. (2001). The job demands-resources model of burnout. Journal of Applied psychology, 86, 499. Wright, T. A., & Cropanzano, R. (1998). Emotional exhaustion as a predictor of job performance and voluntary turnover. Journal of applied psychology, 83, 486. Bakker, A., Schaufeli, W. B., & Van Dierendonck, D. (2000). 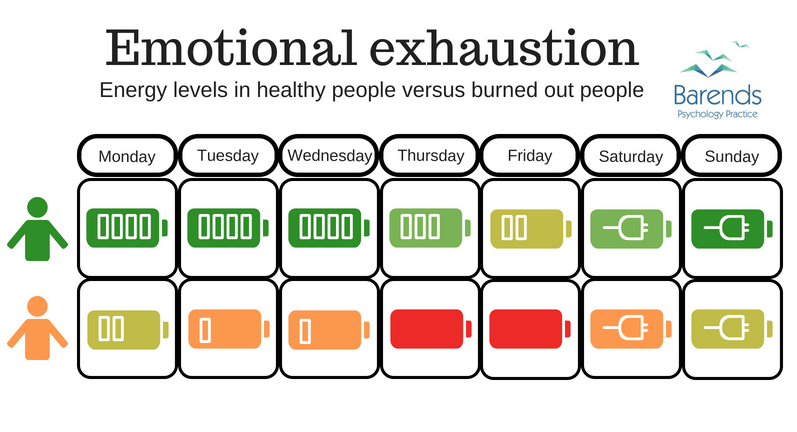 Burnout: Prevalentie, risicogroepen en risicofactoren. Psychische vermoeidheid en werk, 65-82. Ahola, K., Honkonen, T., Isometsä, E., Kalimo, R., Nykyri, E., Aromaa, A., & Lönnqvist, J. (2005). The relationship between job-related burnout and depressive disorders—results from the Finnish Health 2000 Study. Journal of affective disorders, 88, 55-62.